Studio 3 Gallery is pleased to present the Kent Print Collection’s 7th exhibition. 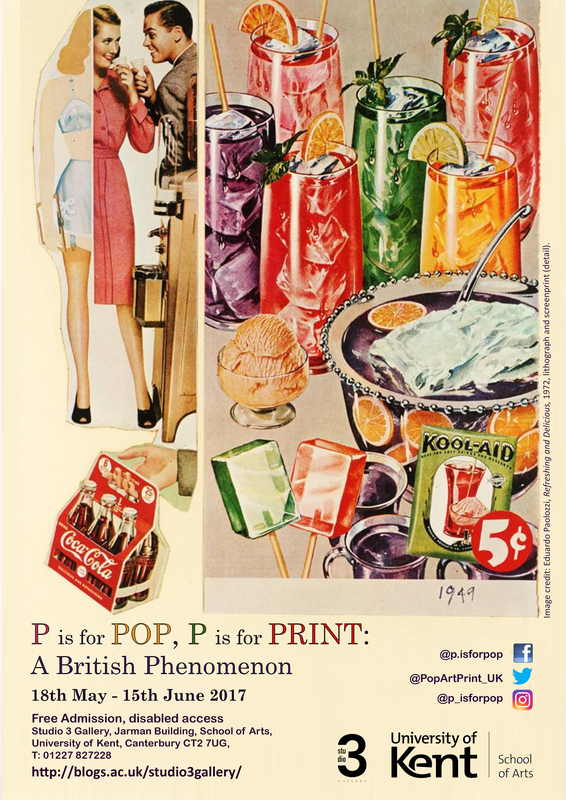 P is for Pop, P is for Print: A British Phenomenon aims to celebrate the birth of Pop Art in Britain and to showcase the important role of printmaking in the original and anarchic art of the 60s and 70s. Bringing together a comprehensive selection of over 35 prints, the exhibition includes iconic and lesser known works by leading British artists Peter Blake, Derek Boshier, Patrick Caulfield, Harvey Daniels, Richard Hamilton, Patrick Hughes, Allen Jones, R.B. Kitaj, Gerald Laing, David Oxtoby, Eduardo Paolozzi, Peter Phillips, Richard Smith and Joe Tilson. Image: Eduardo Paolozzi, ‘Refreshing and Delicious’ (1972).